A Thai variety whose name describes it perfectly. The pointed, elongated fruit stretch out to about 150mm. They start a dark green colour, and then turn to an eye-pleasing red as they ripen. 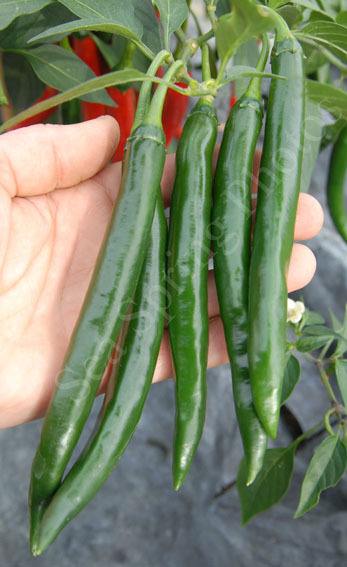 The dark green colour of the unripe fruit makes this the chilli of choice for giving the colour to Thai green curries (Thai red curries get their colour from the use of red chillies). 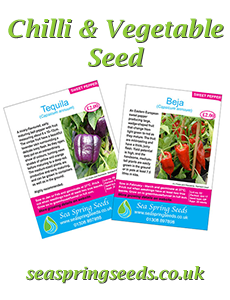 The fruit are mild, which means these chillies won’t blow off the top of your head, thick fleshed and very flavourful. The large bushy plants are quite tidy, though they will need staking as the plants are very productive and get top heavy as the fruit load increases.